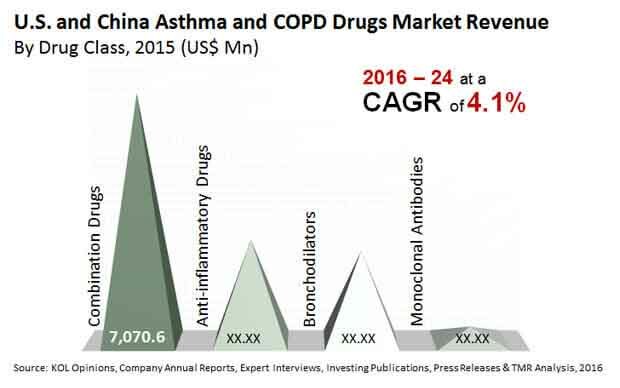 According to the TMR report, the US and China asthma and COPD drugs market will be worth US$18.7 bn by 2024. On the basis of different types or classes of drugs come on the market is segmented into anti-inflammatory drugs, combination drugs, bronchodilators, and monoclonal antibodies. Among these, it is the combination drug segment which is witnessing highest growth. The segment accounted for 54% of the total US market in 2015. The combination drug segment is expected to continue to lead throughout the focus period on account of positive recommendations from organizations such as Global initiative for asthma and Global Initiative for chronic obstructive lung disease, which state that blends the dates are more secure course of treating asthma and COPD.